It seems the best way to spread your message right now is to wear it. 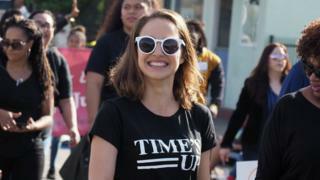 From Topshop's "Feminist" tee to the "Time's Up" tops worn by celebrities like Natalie Portman, slogan T-shirts are everywhere. "It's like a billboard advertising what you believe in," says designer Ashish, whose sequin shirts carry messages supporting diversity. He's one of the fashion insiders telling Newsbeat why T-shirts are being used as a political medium. Katharine Hamnett is often credited as one of the first to create a politically charged T-shirt. When the fashion designer met Margaret Thatcher in 1984, she famously unzipped her jacket to reveal a tee that read "58% don't want Pershing", an anti-nuclear statement. "Democracy was slipping through our fingers and we really felt as if we had no voice," she tells Newsbeat about meeting the then-Prime Minister. "Slogan T-shirts gave you one. You can't not read them even from 200 yards, and once you've seen them they're in your brain." The stunt made Katharine's designs iconic, and the simple, bold typeface was copied everywhere in the 1980s. Fast forward twenty years and Henry Holland introduced the slogan T-shirt to a new generation with his first collection at London Fashion Week. His witty rhyming tees poked fun at the fashion industry, with slogans like "I'll show you who's boss Kate Moss" referencing the big models and designers of the time. "I called them 'fashion groupie' T-shirts because they were my way of showing adoration for these designers I wanted to work alongside," he says. "They were a bit like football shirts for the fashion industry." Because T-shirts tend to be cheap, almost everyone can afford to make their point or show off their interests. "You'd never been able to show your admiration for designers like Heidi Slimane and Giles Deacon for £50 before then," says the 34-year-old. "That's why it worked." But that's where it went wrong for Dior in 2017. When Maria Grazia Chiuri became the first female artistic director of the company she wanted to make her mark - and she did it with her "We Should All Be Feminists" T-shirt. The slogan is taken from a feminist book of the same name by Chimamanda Ngozi Adichie. While celebrated for its statement, Dior was heavily criticised for charging $710 (around £515) for the shirt. "This is one of the paradoxes in fashion, particularly with a T-shirt, because it's an inexpensive item to make," says Jenna Rossi-Camus, who has co-curated an exhibition about the history of T-shirts at the Fashion and Textiles Museum in London. After the backlash, Dior announced that it would donate a portion of the sales to Rihanna's non-profit, The Clara Lionel Foundation (CLF). And it led to the feminist message being copied on T-shirts in every high street shop. "So even though not everyone can afford one with the Dior label in the neck, they can all show their support for the cause," says Jenna. Henry Holland is more cautious though. "My fear is that if fashion jumps on to a certain political message too hard, it's in danger of turning it into a trend," says the Manchester-born designer. "I think feminism is too important an issue to become a trend, and so I would be wary of being too involved in a certain message. "The way fashion works is Dior will put a 'We Should All Be Feminists' T-shirt out, and it'll be in every high street retailer within three months. Then six months later your T-shirt that says something really important is 'last season'." Katharine Hamnett says it's important to really understand the message behind what you're wearing. "T-shirts by themselves are all very nice but they achieve nothing. This is the danger," she says. "The only way to affect political change is to contact politicians and tell them you won't vote for them next time unless they represent your views." Fashion blogger Patricia Batatas says seeing feminist slogans on the catwalk has influenced women like her to do their own research into the cause. "When you have a group of influential people who all appear to stand for the same thing, I think it puts across the message in a powerful way," says the 23-year-old. "It has the ability to open up people's opinions." The Time's Up movement, Women's Marches, anti-Trump rallies and Black Lives Matter campaigns have all used slogan T-shirts to draw attention. "As a consumer, if you're going to buy a T-shirt with that kind of messaging, it shouldn't be about the fact that it's happened on the catwalk," says Henry Holland. "I want you to be buying a T-shirt because you believe in what it's saying, not because it's this season's trend."